25 Dec Streetsigns: more wars on phones. This popped up on Lee Avenue this winter, 2018. It’s been a while since we’ve seen the community’s zealots busy themselves with the cause against smartphones. It seemed as if the matter had successfully moved from some extremists making noise through posters and such to the entire community changing its attitude towards smartphones, so the posters stopped appearing with that same urgency. But now a new angle: posters warning against flip-phones that might not be kosher either. The first sign shows a picture of a phone and it warns that it leads to hell. In the small text the people are warned that community activists had proof that individuals had been ruined by “innocent looking flip phones” that are in reality “treif”, pork, chazer. The other shows us a cheeseburger and warns that treif meat might be cheaper, “it costs pennies and could be found in Walmart for bubkes”, but it isn’t kosher. The message, as I understand it, is that one might find a flip-phone at Walmart at a good price, but if it isn’t a “kosher phone”, then it is treif and “be careful, with a few buttons the filter could be removed”. So many people assume that Hasidim, like other conservative groups, vote on religious values issues. They assume that Hasidim care about gay marriage and abortion, because that’s a Christian conservative political issue. I often explain the distinction in Ultra Orthodox Jewish attitudes towards politics and that of the Conservative Right. While the conservative right considers the law as a source of moral law and instruction, Hasidim see the Torah as the source of moral law. They also don’t consider those outside of their community their moral concern. So Hasidim vote largely based on the interest of the community. They vote like a union. Collectively advancing the interest of the whole by voting as one, and supporting candidates seen as favorable to their “union”. Here are some of the pre-primary election (for Governer of New York and Attorney General of New York) posters in Hasidic Williamsburg in 2018. This poster urges people to vote for candidates who “understand and respect our rights”. In the red part it cries “we need to ensure that the government officials don’t give in to their provocations!” This refers to Yaffed and other activist efforts that have been trying to force change in Hasidic boy’s schools through legal action with the city and state. The poster says “in the current elections some far left candidates are running, and it is expected that they will have less understanding of our religious rights, and there is a terrible danger that they will buy into (not monetarily!) the empty provocations. Again – it’s about defending Hasidic education status quo. “The future of Orthodox Judaism is on the line! Every registered democrat in the entirety of New Yor State is asked, for the good of the public and the individual, to vote in the primary elections this Thursday for Letitia (Tish) James. “investigations! Abloves (?? ), arrests!” I have no idea what abloves means; I sometimes wonder if some standard Yiddish speaker wrote these because I’ll often have to ask German speakers to translate some words for me, like “tzil bret” in this one, which I didn’t know was a shooting target. This for Simcha Felder, another warning about the far left’s lack of religious understanding. 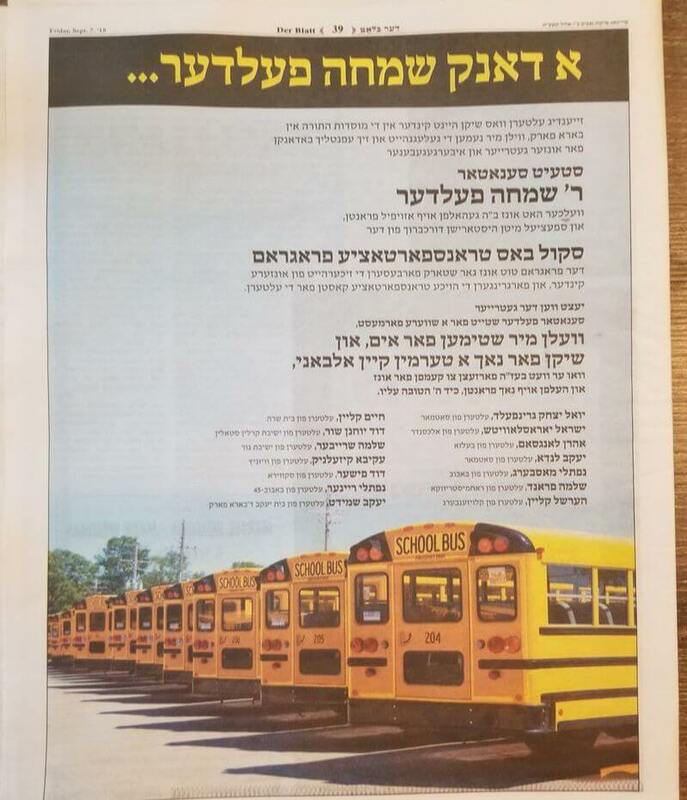 “if you stay home, you elect left-liberals” The poster warns that this can mean no door to door transportation (for the kids, to school – Williamsburg is known to be a hub of school buses), no millions in funding for the community, danger to the traditional education. ​In other words, you can see why people would want to vote in the bloc. Hasidic voters benefit personally from their candidates. As someone on the very far left of much of American politics (shutter!) I find myself sympathetic to many of the issues covered here, like not prosecuting people for petty crimes and turning them into poster children of “justice” (I abhor this type of “justice”, often for the poor) and I think funding should go for social fabric programs like little children’s educations. The lessons for me is that people vote in their own best interest, if only the candidates actually serve their interests. Hasidim’s candidates often do. 03 Aug From Quora: Can non-Hasids rent or buy properties in the Hasidic neighborhoods of Brooklyn? Someone just sent me a message through my business website. They apologized that they are not exactly messaging about my services (walking tours / food tours). But: could I help them find an apartment in Hasidic Williamsburg? This. This is what I occupy my time with. And requests from photographers to photograph Hasidic kids. I get asked to be connected to Hasidim one way or another. All. The. Time. Anyway. The answer is no, not helping you. Because I’m a tour operator, not a realtor. Or photography-something. But. The general question above is a very good one. Can you rent a place in the Hasidic neighborhood? Well. Most Hasidim will advertise their properties in Hasidic publications, often in Yiddish. Odds are, you won’t come across available Hasidic condos in your local Streeteasy or other rental map app. Hasidim in Brooklyn are now pretty big in property management (including outside their enclave, big time), but they treat properties in the community totally differently from properties in greater Brooklyn or even beyond. Rentals in their neighborhood can be advertised with a note on the synagogue wall or a $25 classified ad in the Yiddish paper, and the process involves references and word of mouth and knowing who is who and who your father is. Properties in the “goyish” (gentile) part of Brooklyn often involve middle-men, realtors and the standard credit-check and income-based-qualification process is followed. Years ago, when Williamsburg first started to be very desirable, Hasidim had to contend with the encroachment of outsiders who had a lot more money, could drive up rents, and who could potentially change the face of the insular Orthodox neighborhood. There was a big to-do in the community, and many many people pushed back against letting outsiders outbid Hasidim on property. Some of the pushback came in the form of protest signs in the streets. This poster above warns that “the seller already advertised the apartments on the internet for artisten.” It implores people to call the developer immediately and urge him to cease “selling to artists and d/estroying our city, God forbid.” What’s interesting – if that the sign includes information of a realtor company. But the people responsible for the sign managed to get some phone numbers and list it on the poster. Not unreasonable to imagine they knew who the developer was and just published his home number. This type of public shaming is effective because in a community of exorbitant rents, a lot of people get frustrated by those among Hasidim who sell out their breathren by selling to outsiders who could afford to pay more. The bullying and shaming often comes from the more zealous elements of the community who are not driven by economical concerns but by a concern about the spiritual effects of an influx of bare-shouldered overall-wearing hipster ladies who could hurt the eyes. But the zealots can’t be effective unless people respond to their shaming and noise making, and housing is one cause people care about. Because try figuring out how to secure a home for a family of 5 when you’re not yet thirty and you live in one of the country’s most expensive neighborhoods. So the zealots and economic motivations combined means that Hasidic developers who want to conquer the artistes market focus their attention elsewhere. As a tour guide in Hasidic Williamsburg for five years, I’ve only seen a handful of non-Hasidics sit on stoops in the main sections of private-property Hasidic Williamsburg (public housing is different – there are strict racial quotas and fair housing laws). The Hasidic homes have big gates on the windows and giant porches; they are built for Hasidic life and Hasidim keep it amongst each other. PS: A Hasidic fella I know once said to me: why don’t you dress up Hasidic, pretend to be pious and all, speak your Yiddish and such, and buy a home from a Hasidic person for Hasidic market value. Then, tear off the Hasidic getup and sell the property to outsiders. You’ll make 200K easy. I said no, thank you. I’m not sure if it’s the Hasidic in me, or the goyishe straight fool in me, but it is not my thing. 07 Aug From Quora: How are Hasidic Jews so wealthy? They don’t believe in a college education, but one was able to buy a former hotel in my neighborhood. As a tour guide in Hasidic Williamsburg, I’ve gotten used to being asked this question. The first time I explained how Hasidim are educated – with all emphasis on religious learning – and I got this question, I didn’t expect it. Having grown up Hasidic I wasn’t used to thinking of education in the strictly vocational way that secular people think of it. Apparently in the secular world, and that is everywhere (we have tourists from all over the western world) education is thought of as purely work training. People think they go to school only so they could earn a living. Twelve grades plus four years college, plus a masters, in order to peddle this skill or that product. It is fascinating that people have forgotten that you could learn things on the job. People assume that if you don’t have a formal education in something, then surely you are handicapped forever. But the world wasn’t always that way, and humans can learn things quickly. There was a time when people learned skills on the job, and schooling had nothing to do with those skills. If you were to become a carpenter, you’d apprentice for a few years. If you had gone to the local one room schoolhouse, your elementary training would have done nothing for your carpentry skills. It makes me ask: is work really what education is for? Just a job? Are you learning all these subjects only to sit at a nine to five? Shouldn’t education be for a greater purpose? And why can’t people learn things without being taught explicitly how to do it? What happened to osmosis or adaptive skills or autididactic learning? Here is the thing. In the secular world, people believe you can’t do anything if you haven’t gone through some formal training, paid money and received a paper to assert your qualification for that work. Nevermind that to get said paper you just need money for tuition and to show up. You just. Must. List. Degrees. Colleges. Proof. But Hasidim have a different system. I was hired right our of high school without even a valid high school diploma. I was trained to do whatever work in the insurance office needed to be done, and ultimately did large group renewals. Everyone in our company had less than a high-school diploma. We operated in a world in which you were given economic opportunities just because you had a good reputation. Some men got work through family at early ages, maybe at nineteen and by the time they were 24 were experienced and out on their own, successfully. Almost no one among Hasidim has heaps of student loans or years whiled away getting a degree. That gives these people significant advantage in the competitive economic market. Nevermind the advantage they have in their built in network that the community is. 09 Jan From Quora: Are there any particular rules I need to be aware of when working with Hasidic Jews? I’ve worked in the Hasidic (Satmar) community since I was seventeen. Not to give my age away, but that’s some fifteen years and counting. These are all the Hungarian Hasidim from Williamsburg and sattelites; not the more Americanized ChabadHasidim. There are some Hasidic men with whom I’ve had a professional relationship for my entire adult life, and yet I’ve never had a significant personal conversation with them. Ever. It’s pretty startling. I never said “I’m getting divorce” or “I’m moving”. I just notify them to change my exemptions and reporting address. It is forbidden for a man to talk extra words with a woman, and of course not to get into a friendly conversation, or god forbid to kid around (make jokes) or laugh, etc. It is permitted to talk about things that need to be done, and it is also permitted to say “good morning” or wish “mazel tov” etc. One needs to be careful, however, not to say it in a friendly way. If a woman needs to say something to a man, she should not stand too close to him, only at a distance. It is forbidden to address a woman or girl by her first name, only by her family name. It is forbidden for a man and a woman to compliment each other “personally”, for example to say “you did a good job. It is only permitted to say “the job” was well done. In the event that a man gives a compliment to a woman or vice versa, then the other person must pretend that they didn’t hear. The above, was the contract from one company that was very stringent. Over the years I’ve learned that there is a great spectrum of religiously acceptable behavior among Hasidic professionals. But I’m showing you what expectations in one company were because it can never hurt to go in understanding that on some level, the ideal of piety in workforces look like that: strict, strict separation of the sexes. Know the basic rules of sexual separation. Avoid the dreaded erect handshake. Among almost all Orthodox Jews (not all, but many who look Orthodox) men don’t shake hands with women, and vice versa. Make it easier by casually avoiding the whole shpeil. It can easily be skipped without everyone fiddling with their fingers awkwardly. Eventually, as you know more about that person’s preferences, you might figure it out by either observing him/her or asking directly. Also: men and women aren’t supposed to be friends. Also: men and women aren’t to pass items directly into each other’s hands. Don’t be their Satan. Don’t try to ask big questions and get your coworkers to simplify when they do what they do. Most people don’t need you to “enlighten” them. Hasidic culture is radically different, and most comments are lost in translation. All you do by trying to critique is show disrespect. Don’t be their Rabbi. I have a friend who is what’s called “A Hasidic Double Lifer.” That is, he is a secular thinker, but because of familial obligations is committed to living his life externally as a Hasid. He told me recently that he went into a restaurant in Israel, and tried to order – let’s say – falafal. The woman at the counter was a secular Israeli, and she answered “zeh loh kasher”; it isn’t kosher. That friend tried to insist, and again the cashier said “but it isn’t kosher.” I can imagine that this woman tried to be helpful, but she wasn’t. Never try to impose on Hasidim expectations of piety. Some Hasidim deal with complex scenarios of trying to protect a fragile place in the community for their entire family, but also not always being able to drag around its shackles. Don’t check their compliance, thank you. Don’t get shocked when they resemble people. When I was Hasidic and I wore the whole headgear, people consistently gasped if a word of even mediocre intelligence left my mouth. The patronizing gasps! Don’t hold Hasidim to different standards than your average goy. They are born with the same brain. Remember that many Hasidim are ordinary folks who were born into the sects, they did not choose it. Some are bright and self taught in various fields, some curse, some have secret interests. People are people. Take your cues from them and ask openly if something is okay. Want to have lunch? Good. What are your dietary specifications? Kosher? What kind of kosher? Good. I’ll look up a place online, unless you want to suggest one. See you soon. Give friendships a chance, but don’t fetishize. Here’s my tip: watch out for how someone might open up when they are alone. Hasidim are a very social group; there’s a lot of social penalty for acting “not normal”. Be sensitive to repeating what someone told you in private, even if it seems harmless.Will this help? I hope so. I hope it won’t make you fall over yourself.